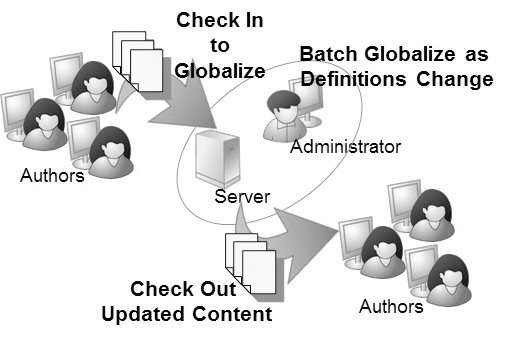 Definitions for terms in uPerform content can be updated using a process called globalization. During globalization, definitions are inserted into documents and new terms in documents are gathered for inclusion in the central glossary on the Server. The globalization process affects only text within recorded Field/Description tables. Text within Field/Description tables manually inserted during editing is ignored. If a term exists in the document, but not in the glossary, the term is added to the glossary with a blank definition. The glossary will then need to be updated with a customized definition of the new term. You can then globalize to distribute the update to the documents containing the term. If your glossary administrator has enabled the centralized glossary, all uPerform documents will be globalized upon check in. Non-uPerform documents, such as managed documents, are not globalized. The glossary functionality is not case-sensitive, meaning that a term in a document will be considered the same as a term in the glossary regardless of whether the same capitalization rules are applied. Purchase order and Purchase Order in documents are considered the same term. The Glossary is character-string dependent, however; Purchase order (one space) is different than Purchase order (two spaces). During globalization, each globalized document receives a minor version update only if modifications have been made to the document (for example, 1.1, 2.1, 3.2). Select the document to open. In this scenario, the document will not display in the globalize history list. In addition, uPerform documents are automatically globalized when the documents are checked into the Server. For detailed information on creating a daily globalize task, refer to Scheduling Automated Tasks in the companion manual Administration. Via the globalize queue, you can also immediately process one or more documents. You must be a part of the Glossary Administrators group to configure glossary settings and manage the glossary queue. For detailed information on groups, refer to Managing Users, Roles, and Groups. The globalize queue displays the documents that require update. The globalize history list displays a record of globalization events (both documents globalized upon check in and daily globalize runs) for the current day. You can view history records from the last 30 days. After 30 days, history records are removed on a first-in/first-out basis. History records are not archived. Click View Globalize Queue on the left menu. Click on the column headings to sort the glossary queue. Click the up and down arrow beside the column heading to sort by ascending and descending order. The name of the document included in the globalize processing. Click on the document name to go to the document's cover page. The name of the project containing the document. The date of the last document modification. The author who last added the document. The activity which caused the document to be added to the queue. The date and time the document entered the queue. The status of the globalization activity (In Queue, Waiting, Processing, or a failure indicator) for the current document. Click Globalize All on the left menu. Click Delete All on the left menu. Click Refresh Queue on the left menu. Click Remove next to the document you want to remove. Click Globalize Now next to the document you want to globalize. Click View History on the left menu. Lists the title of the globalized document. Lists the date and time the globalize process was started. Lists the date and time the globalize process was completed. Lists the number of uPerform terms processed during the globalization activity. Click on the hyperlinked number to review the list of terms processed. Lists the success or failure of the globalization for the document. Lists the reason the globalization task was initiated (for example, Document Checked-In). Click View Different Date on the left menu. Click View All New Terms on the left menu. Click on the term to see more information about it. Click View All Undefined Terms on the left menu.